Wyatt Hathaway scores 18 and Cole Morin has 17 as Leavitt remains unbeaten with victory over Mt. Blue. 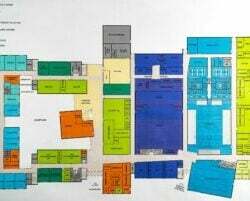 TURNER — Anyone who misses the short-lived football rivalry between Mt. 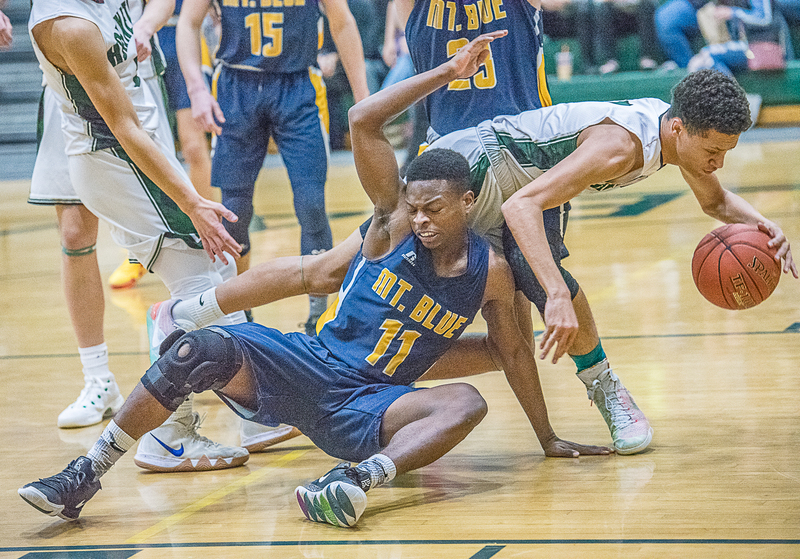 Blue and Leavitt might consider Thursday night’s boys’ basketball game a close hardwood facsimile. Unbeaten Leavitt took advantage of the physical tone and foul trouble to Mt. Blue’s top two players to pull away at the free-throw line in the fourth quarter in a 53-40 win. 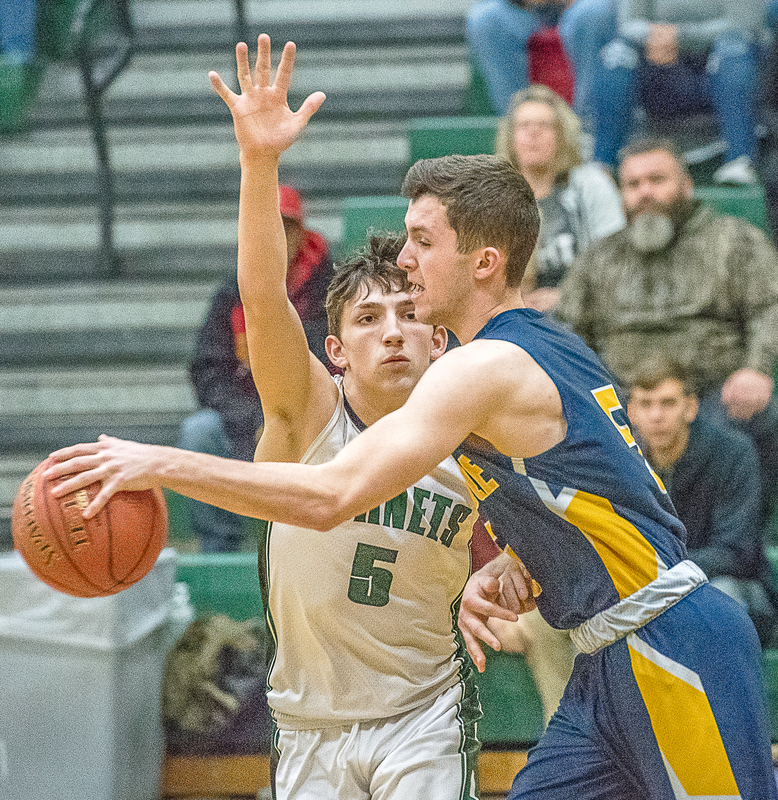 It was the Hornets’ second win of the season over the Cougars, having won the Dec. 18 matchup in Farmington, 65-62. 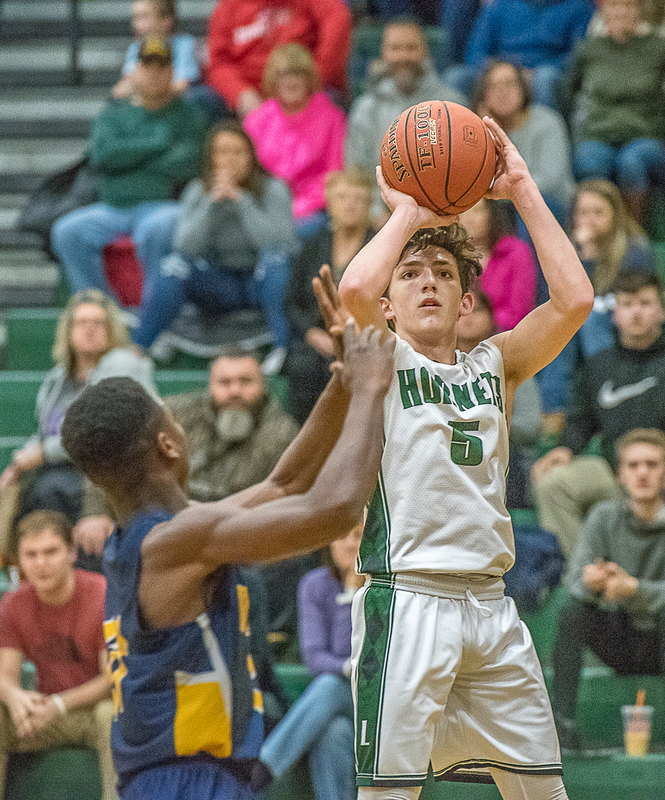 Sophomore guard Wyatt Hathaway scored a game-high 18 points to lead the Hornets (10-0). Junior center Cole Morin, who had a game-high 22 points in the first meeting, scored 10 of his 17 points in the fourth quarter. He also had 13 rebounds and three blocks. Jacob Farnham led Mt. Blue (8-3) with 15 points. After a nightmarish second quarter in which they missed their first 13 shots and scored just two points, the Cougars came roaring out of the locker room for the second half and scored the first 13 points to take its biggest lead of the game at 23-16. Farnham’s layup off Garrett Reynolds’ steal tied it at 16, and Reynolds’ 3-pointer put them ahead. James Anderson’s layup gave Mt. 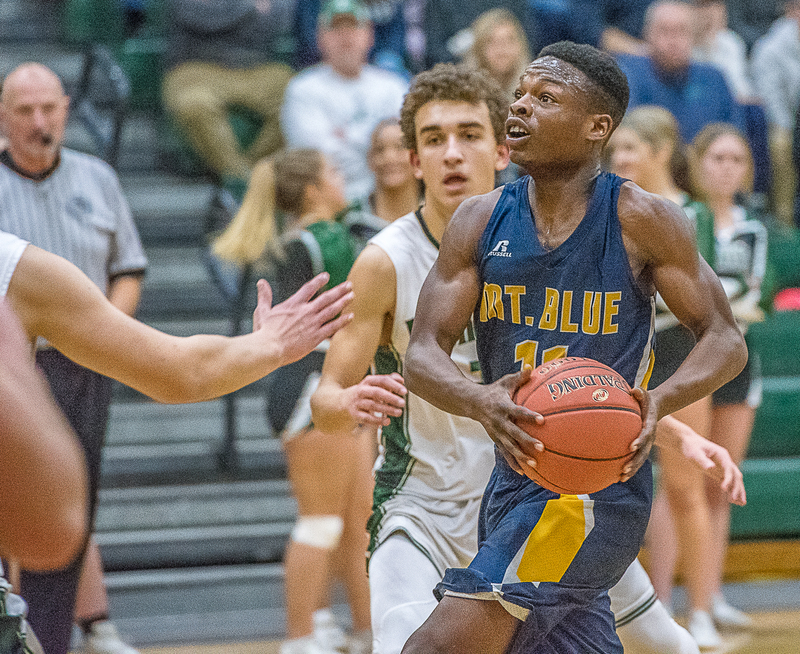 Blue a seven-point lead before Hathaway finally got Leavitt on the scoreboard in the period with a hoop three minutes into the quarter. That started a 7-0 run that pulled Leavitt back within one, but 18 turnovers plagued the Hornets throughout the first three quarters and Mt. Blue led, 28-26, heading into the fourth quarter. A Randy Barker 3-pointer increased the lead to 31-26 early in the fourth, but that would be the Cougars’ only points for nearly the first three minutes of the period. 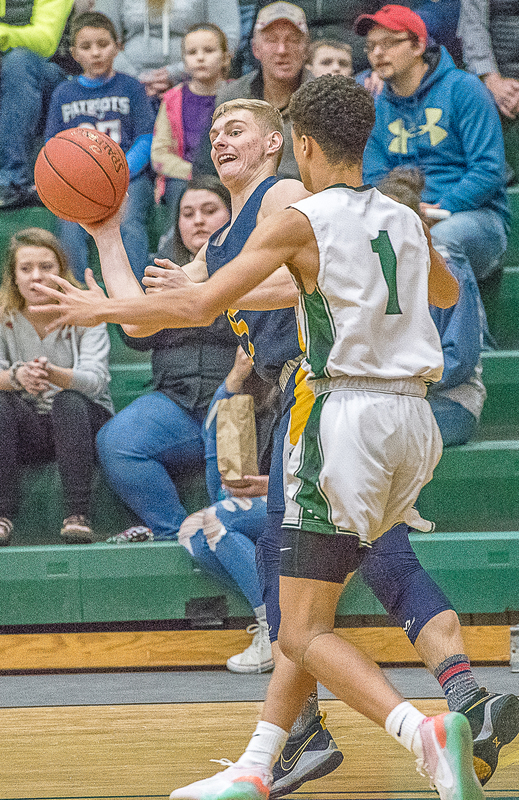 Josh Banks kicked off a 10-0 Leavitt run with a hoop off a Hunter Hayes assist. 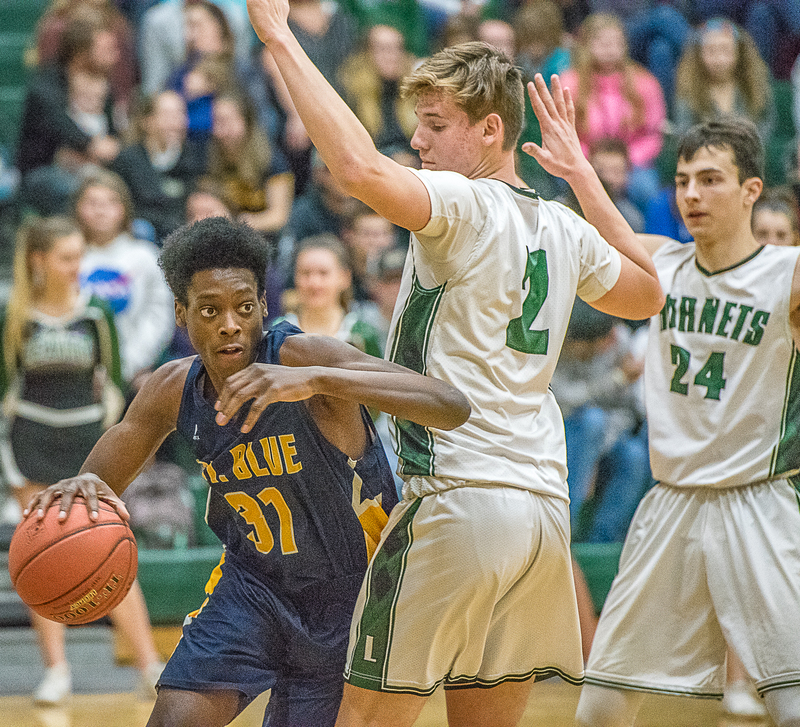 Hayes, a freshman, continued to be the facilitator as the Hornets pounded the ball inside to Morin, who scored the next eight points in the run that produced a 36-31 Leavitt lead with 5:11 remaining. With Anderson and Reynolds combating foul trouble, Mt. Blue couldn’t find an answer until Farnham’s jumper ended the drought and made it 36-33 with 5:02 to go. That was as close as the Cougars got, though, as Leavitt answered with a Hathaway runner and two Morin free throws. Reynolds fouled out with 3:35 remaining (Anderson fouled out in the final minute), and Leavitt drained 13 of 20 free throws (65 percent) in the fourth to pull away. The teams combined for 18 turnovers and 5-for-20 shooting from the floor in the first quarter as Mt. Blue took an 8-5 lead. A jumper by Morin kicked off a 10-0 Leavitt run while the Cougars went scoreless for almost seven minutes in the second quarter. Seven more turnovers and 3-for-10 shooting by the Hornets helped keep the Cougars within striking distance. Farnham’s hoop with 1:12 left in the half finally got them on the board, pulling them within 15-10. “It’s a credit to how hard we played defensively that we stayed in the game even though we played our worst offensive game of the season, our worst offensive half of the season,” Magnusson said.